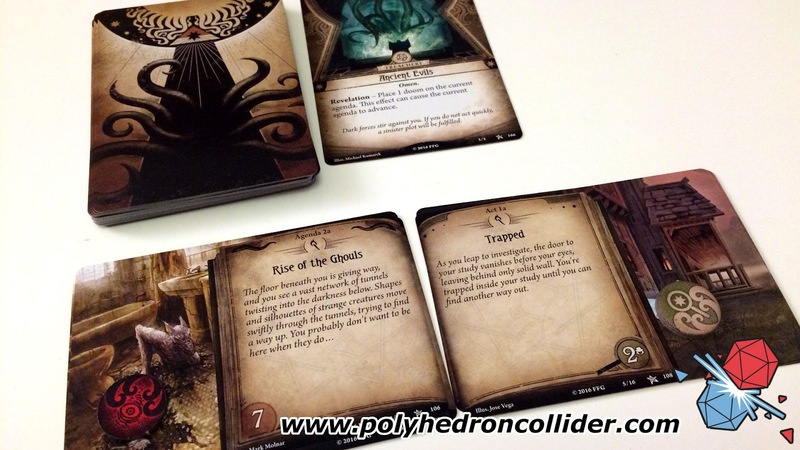 I should preface this review by saying I love the Arkham Horror series of games from Fantasy Flight Games. Arkham Horror is up there as one of my favourite games of all time. I love the way it blends the works of H P Lovecraft, filtered through the Call of Cthulhu RPG, with a heavily thematic and punishingly difficult cooperative experience. So far every game in the series (with the exception of the now defunct Call of Cthulhu card game) have managed to deliver on that base concept, whilst still bringing something different to the table. At the same time I am losing faith with the LCG or Living Card Game concept, the system requires a dedication both from a financial standpoint and finding players who will share that path with you. And so my anticipation is high. 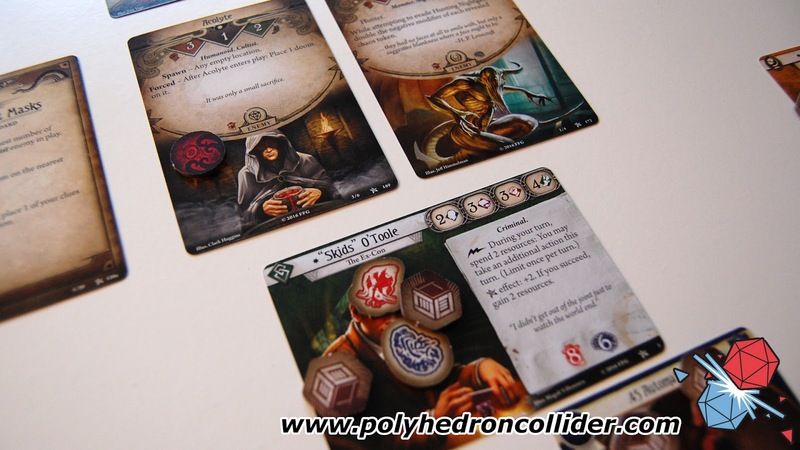 Can Arkham Horror: The Card Game replicate the theme, cooperation and impending sense of doom into their Living Card Game range or does it get bogged down in a distribution method that I feel at odds with? The answer is that Arkham Horror: The Card Game is exactly what I was expecting, in both good and bad ways. 1920s Massachusetts is a dark and dangerous place; monsters crawl beneath the very streets you walk upon, cultists hide amongst the general populace and both work together to summon ancient alien evil from alternative dimensions. You step into this dark and disturbing world as one of a possible team of investigators, each trying to shed light into the dark corners of Arkham and hoping the baggage you carry with you doesn't drag you screaming into that darkness. You will start in your own house, where dark forces have trapped you in your study and depraved creatures are crawling out of the floor. It’s important to set such a scene when describing Arkham Horror the Card Game, as this is a game that really does want to tell a story. Each mystery presents a full narrative that is played out over several games. Not only does each story transform based on your actions and relative success, those changes affect the next game in the scenario. It means that a simple mistake or failure in the first game can have repercussions three games in. It can be punishing but I love it. 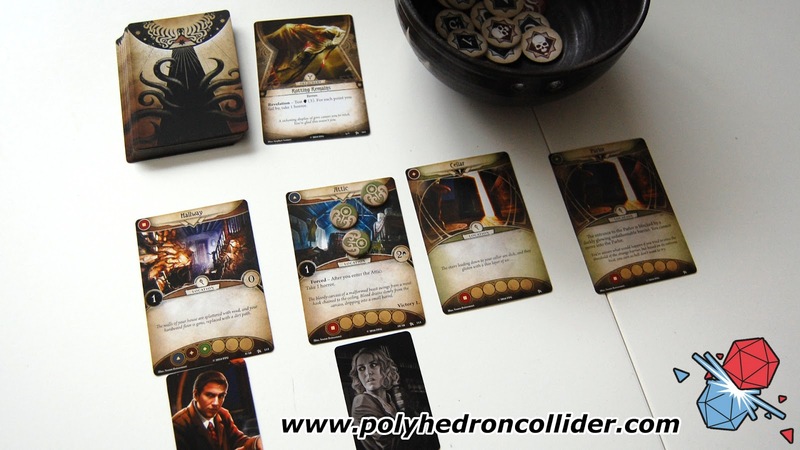 Mechanically Arkham Horror the Card Game is exactly what you would expect if you tried to cross the original Arkham Horror board game and Warhammer 40,000 Conquest, both games' DNA can clearly be seen in this Arkham Horror’s design. Investigators will need to move to locations and collect clue tokens while fighting of deranged cultists and otherworldly beasts. To do this you will play cards from your hand which could be weapons, relics and spells that tool up your investigator or special attacks and actions. Each card has a resource cost to put into play and, of course, managing these resources is going to be important to optimising your actions. Throughout the game you will be called upon to make skill checks, comparing your skill level against the difficulty of the task. To determine if you have succeeded or failed you will draw a token from a bag or bowl. Each token affects your current skill level and the process is akin to rolling a dice and adding your skill level. This token pool allows a wide range of possible outcomes and allows the scenario, and your previous experience, to add or remove tokens from this repository. It gives the writers of future scenarios the opportunity to customise the randomness as the story requires and it empathises a key point of Arkham Horror the Card game; potential, but we'll talk more on that later. To help with skill checks you can also discard cards from your hand to use the symbols in the top left to boost your score. Warhammer 40,000 Conquest players will recognise this mechanic and it works really well, giving that decision between using a card for its written effect or for the skill boost. This decision and versatility doubles up when considering making your own deck, you need to balance items and effects against the skill bonuses you think you might need. Deck construction in Arkham Horror presents some new and really interesting concepts. Basic deck construction follows rules that any Living Card Game player will be familiar with; select an investigator to play and then create a deck based on a major skill group and minor skill group based on your chosen investigator and as many neutral cards as you wish. But Arkham Horror is a campaign game, as you play you can spend this experience to buy new cards or upgrade existing cards. It’s not all good though as you can also pick up madness. Each player starts with one madness in their deck and a couple of negative cards based on their investigator. Whenever these cards are drawn from the deck bad stuff will happen and to me this is where this game really nails that sense of dread and despair that the series is known for. It’s at this point that my issue with the Living Card Game system raise its ugly heads. As I write this review only the core set for Arkham Horror has been released which means the pool of cards available is very limited, but that is a problem that will disappear in time once more products in the series have been released. My other problem is the concept of the core set, an issue I also had with Warhammer 40,000 Conquest. A core set alone offers extremely limited options for deck construction, each investigator requires all the cards from your two skill groups and all but one or two of the neutral cards. 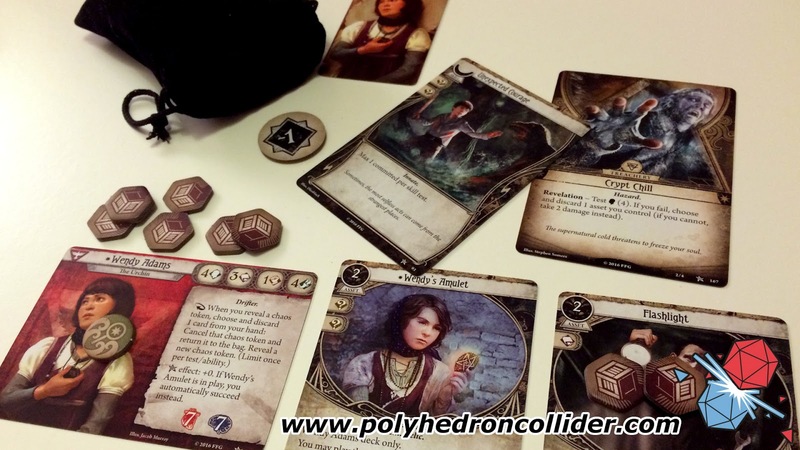 Because skill groups are shared, with a single core set there are certain character combinations that can't be played together, as both investigators require the same cards. To get around this problem, and give yourself deck construction options, you will have to buy a second core set. This has presents two problems. First, due to the rising cost of board games, that core set retails for £36.99 RRP (of course deals can be found online). My second issue is that if you do buy a second core set 110 of the 240 cards within are useless. The core set is made up of scenario cards that tell the story and investigator cards that are used to create your decks; you will only ever need one set of the scenario cards so I really don't understand why Fantasy Flight Games make you buy a product where half of the contents are effectively wasted. The core set contains only one story, made up of 3 intricately woven scenarios. Each one will take you round an hour to complete. I thought that this would annoy me a lot more than it actually has. Even on the normal difficulty the scenario presents a significant challenge, and you can up the difficulty buy adjusting the token pool. There is also the chance to try out each of the investigators and see how each approaches the various trials and monsters. This leads me to the point about potential. At the moment the selection of cards available to build your deck is slim and the scenarios to play are few, but as more and more expansions are released those options will expand with them. It is not going to be cheap to stay on top of these expansions but as long as the quality of the scenarios meets that of the core set, it is going to be a rewarding experience. My criticism of the distribution notwithstanding, Arkham Horror the Card Games is everything I was hoping and expecting it would be. It really does capture that RPG-lite element of the original board game and makes a game that is even more narrative and thematic. 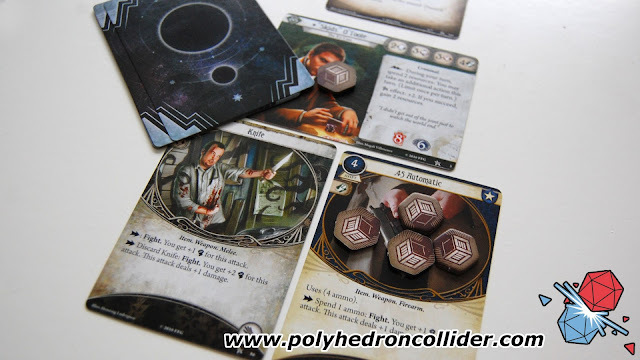 There's some real innovation here in the way Fantasy Flight Games have created a living Card game that allows the player's character to level up, gain skills and suffer from ongoing madness caused by the cosmic horror of the mythos but most importantly, tell a story. This review is based on a full retail copy of the game.